If you are looking for something fancy or unique, you probably cannot find it at Pepperoni Pizzeria. Pepperoni Pizzeria sells simple, good old Italian food. I think it has the best pizza I've had in Singapore. The pizza crust is thin and baked in a wood-fire pizza, so the pizza is nice and crackly. Their family-sized pizza comes in a size for a family of 8. It is really huge and you can choose to have 2 flavours in a pizza. The funghi (mushroom) pizza was good. A variety of mushrooms are used and the result is a very simple yet flavourful pizza. I liked the seafood pizza a lot. Actually, it's probably my favourite seafood pizza ever. The pizza came to our table smelling absolutely great. I think the smell and flavour came from the calamari and clams. (Yes calms, as in those in vongole. They were yums!) Fresh prawns were also added and these were cooked to perfection - springy and crunchy, not overcooked and limp like most prawns in pizzas. The starters were fairly good too. The portobello mushroom was HUGE and well fried. The sauce that came with it was good too.. although I would prefer it without the pieces of chicken. The deep-fried portobello mushroom - it looks like a steak, no? I liked the rocket salad although it was a little plain. But plain and simple is pretty good sometimes. The tortilla chips, fried wings and meatballs were average - more like pub snacks made from frozen food than starters in a decent restaurant. 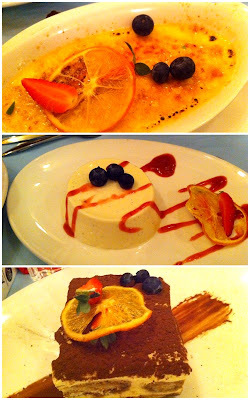 The desserts that we had - panna cotta, creme brulee and tiramisu were all okay but nothing fantastic. Our desserts were average. Could it be because we were so full? I liked the beer though. I had a girly Wittekerke Rose beer and thoroughly enjoyed it. It had a really distinct raspberry flavour to it and wasn't strong at all. I would be going back again to have more pizzas and beer, 2 ultimate comfort food. Hi! I came across your blog via Steph's. The pizza and mushroom look good! I've only tried one Italian place in Singapore. Most of the time the foodie in me is quite content feasting on your specialty dishes such as the chicken rice, cereal prawns and pepper crabs. Great blog! hi Bom the PlantChaser, thanks much! I'm happy to feast on local specialties too actually. Thanks and happy anniversary! It looks very delicious! I would certainly try if I ever travel to Singapore.